When a tree dies or becomes diseased, it’s important to have it removed quickly and safely. If it isn’t removed, a diseased tree may spread its blight to other trees throughout the neighborhood and kill them off. 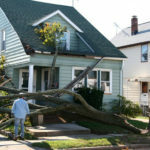 If a tree is dead, or is dying and it begins to rot, the tree will collapse and cause severe damage to your home, car, or even any loved ones that are unlucky enough to stand beneath it. If a storm comes, the winds could blow down a dead tree and cause damage to whatever sits in its path. This is why it’s important to remove your dying or diseased trees before something happens. Walt’s Tree & Stump Removal can remove your tree, grind down the stump, and recycle all healthy wood into mulch. If your tree does end up falling during a storm, Walt’s has 24-hour emergency service to remove the limbs from your property.